Very nice place, clean, modern and comfortable. Everything you need is available (even PC games). Friendly owner. Quite close to the city center - 7-10min walk. Very good place to stay with children, perfect location. There are some great restaurants right outside the apartment. City сenter with pedestrian and shopping areas within walking distance. Really grate location. Apartments were clean and shiny. Owners very polite. Really nice place to stay. The location is great, less than 5 min from the centre. The apartment is very clean, everything is new, the beds were very comfortable. Really easy to reach from the airport and ideally located for all the sights of Bremen. Plenty of local shops and restaurants. Very clean and well equipped apartment. 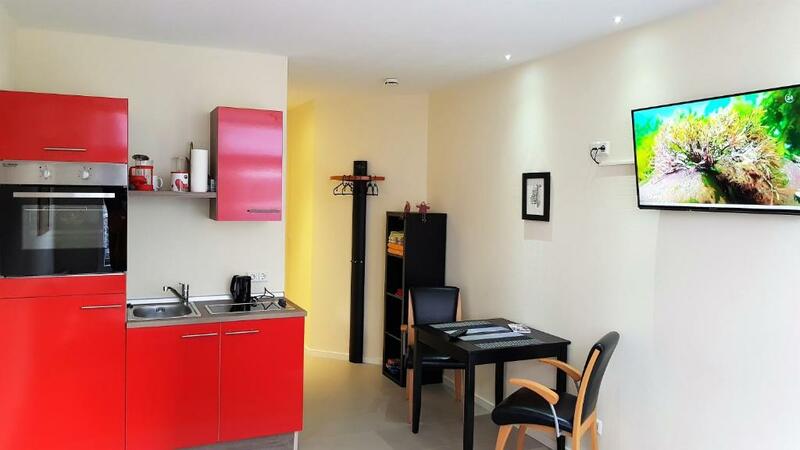 Wonderful apartment, within walking distance of all interesting landmarks. Fully equipped kitchen, amenities. Strongly recommended. 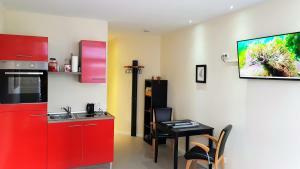 The apartment was very close to the centre of Bremen and had plenty of eateries nearby. The apartment was spacious and well equipped. Everything was great, the host was very friendly and helpful. The balcony is safe for children. I particularly liked the pillows and the lamp in the bedroom! 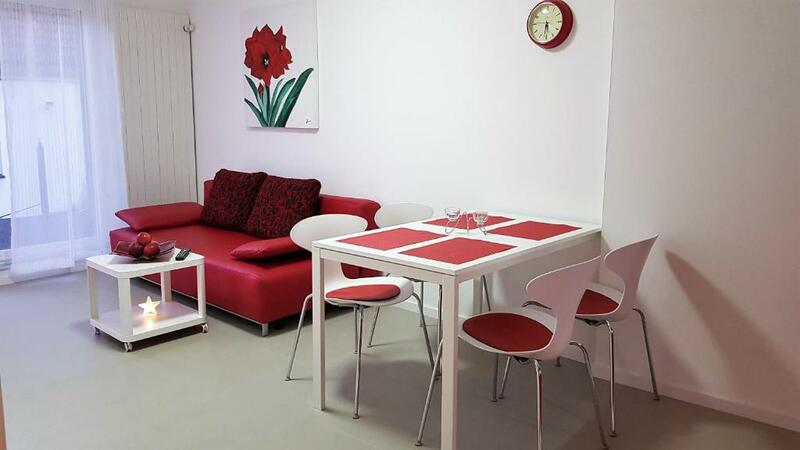 Lock in a great price for Ferienwohnungen Hankenstraße - rated 9.3 by recent guests. Set 50 yards from Weser Promenade, Ferienwohnung Hankenstraße is located on the third floor and offers accommodation in Bremen. 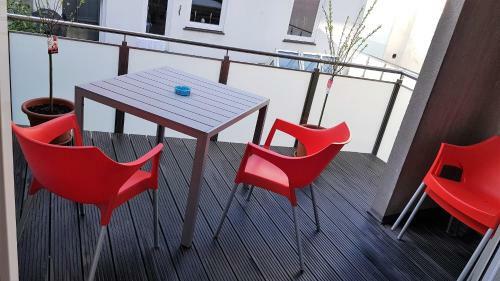 It boasts views of the city and is 0.7 miles from Fairground Bremen. This apartment was renovated in 2016 and is only accessible via stairs. It features a living room with an open kitchen and dining area. There is one bedroom with a double bed and another one with two single beds. A balcony and a bathroom are provided. Towels and bed linen are offered in this apartment. Several restaurants, cafés and shopping facilities can be found in the surrounding area. Weserburg - Museum for modern Ar is just 550 yards away. Wilhelm Wagenfeld Haus and Kunsthalle Bremen are 650 yards from Ferienwohnung Hankenstraße. The nearest airport is Bremen Airport, 1.9 miles from the property. Ferienwohnungen Hankenstraße has been welcoming Booking.com guests since 12 Sept 2016. When would you like to stay at Ferienwohnungen Hankenstraße? 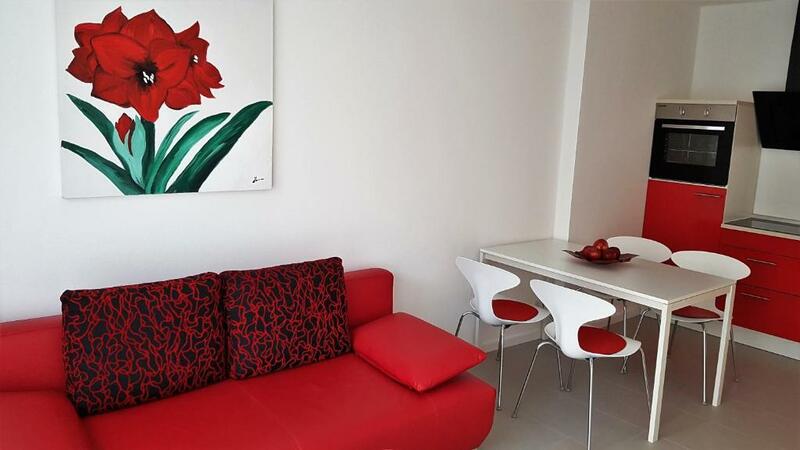 This apartment was renovated in 2016 and features a living room with an open kitchen and dining area. There is one bedroom with a double bed and another one with two single beds. A balcony and a bathroom are provided. Two additional guests can sleep in the sofa bed. Please note the apartment is located on the 3rd floor and there is no lift. Im Zentrum von Bremen bietet das 60 qm große Ferienwohnung für bis zur 6 Personen eine komfortable Unterkunft. Die Wohnung wurde 2016 komplett renoviert und besteht aus einem Wohnzimmer mit offener Küche und Essbereich, ein Schlafzimmer ferfügt über ein Doppelbett (1,8x2,0m) mit hochwertigen Matratzen, weiteres Schlafzimmer über 2 einzel Betten, Duschbad und ein Balkon. Eine weitere Schlafmöglichkeit fur 2 Personen bitet die Ausziehcouch in Wohnzimmer. Das Apartment verfügt über eine voll ausgestattete Küche. Bettwäsche ist vorhanden. Sie wohnen mitten in Bremen und sind nur wenige Schritte von der Schlachte entfernt, Bremens beliebtester Promenade direkt an der Weser. Die Innenstadt, der Schnoor und das Viertel sind zu Fuß in wenigen Minuten erreichbar. 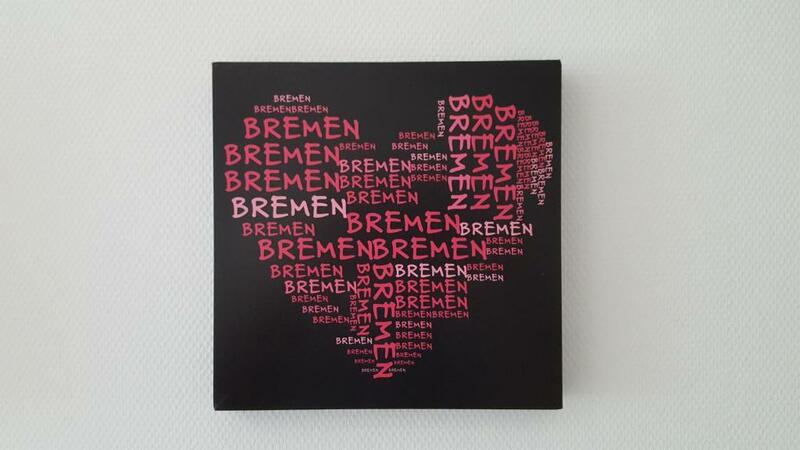 So können Sie Bremen vielseitig erleben. Die Sehenswürdigkeiten wie das Rathaus, Stadtmusikanten (750 m) und das Museum für Moderne Kunst (450 m) und vieles mehr. Die Wohnung bestens mit öffentlichen Verkehrsmitteln angebunden an Flughafen und Hauptbahnhof. Property surroundings – This neighbourhood is a great choice for travellers interested in Old Town exploring, city trips and restaurants – Check location Excellent location - show map Guests loved walking around the neighbourhood! House rules Ferienwohnungen Hankenstraße takes special requests - add in the next step! Guests must be quiet between 22:00 and 09:00. Please inform Ferienwohnungen Hankenstraße in advance of your expected arrival time. You can use the Special Requests box when booking, or contact the property directly with the contact details provided in your confirmation. A bit cool in winter. Cannot put here any detail that makes me unhappy. We should have stayed longer, my kids loved this apartment. We were given excellent directions to the property as well as information on how to collect the keys. The apartment was very clean and well stocked. We had a bottle of water and Prosecco waiting for us in the refrigerator, very welcome after our train ride with no air conditioning. Our host checked on us to make sure we had everything we needed. The location is great, we walked to the piazza down the street and enjoyed some outside music. The apartment is on the third floor with no lift. The ground floor is dark at night with the ground floor light switch only found at the bottom of the staircase. 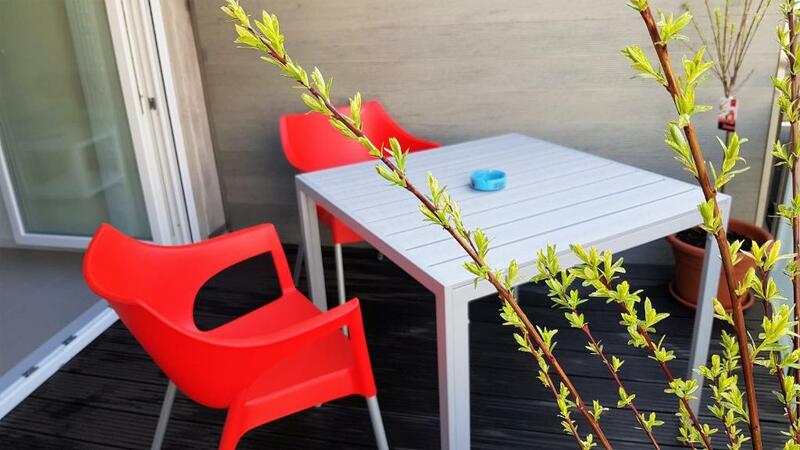 Located very close to the city centre and walking distance to shops, restaurants, tram/bus stop with the main central station 10 mins away by public transport.